I remember from horsemanship books I read as a kid that the "proper" size for a horse was such that the rider's feet would hang just at the bottom of the horse's chest. This was from a British/English perspective. I've noticed that nowadays (among dressage riders particularly) the fashion is for very large warmblood horses, most at least 16.2, often as tall as 17 hands, even when the rider is fairly petite. These larger, long-legged horses offer a big stride and make an impressive appearance in the ring. 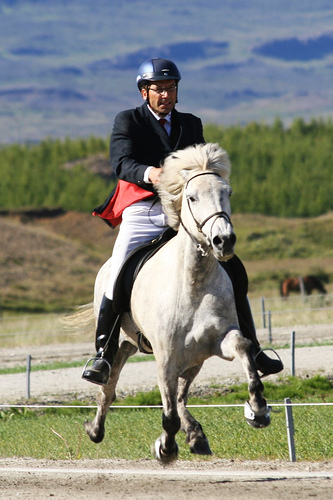 On the other hand, in Western riding and Saddleseat riding, where the popular breeds are the Quarter Horse, Morgan, Arabian or Saddlebred (breeds that tend to be 14.2 to 15.2 hands high), people of any size or height ride the horse regardless, even if their feet hang below the belly a bit. Likewise, in other areas of the world where indigenous horses tend to be quite small (Mongolian horses, Icelandics, Pasos, Connemaras and many other breeds are often 13-14.2 hands), all manner of adults ride these horses, feet hanging to the horse's knees if necessary. Horses are very strong, even the small ones, and quite capable of carrying a large person for long distances, particularly when the person is a good, balanced rider. In some cases extremely large size is counterproductive, as it can be in dogs, leading to joint stress and lack of stamina. Smaller horses offer the advantage of being easier to mount, being more agile, and being able to survive and work on less food. Photo of Icelandic Horse by Tom Olliver on Flickr.